CHICAGO (WLS) -- The Chicago Bulls may name a new coach Tuesday, according to published reports. 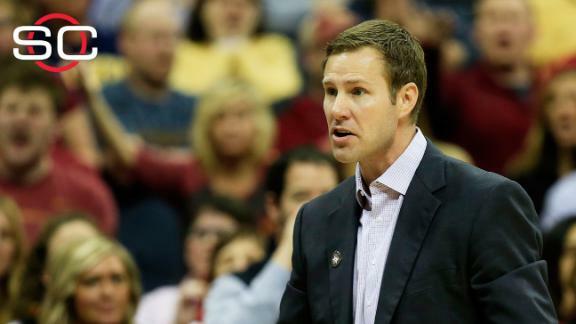 The Des Moines Register is now reporting that Iowa State head coach Fred Hoiberg will take the Bulls job Tuesday. Hoiberg is a former Bulls player who has had coaching success at Iowa State. He had open heart surgery last month and reportedly will not make any announcement Monday, because it's his kids' last day of the school year. Chicago Bulls General Manager Gar Forman announced Thursday that Tom Thibodeau was no longer the team's head coach. Bulls Chairman Jerry Reinsdorf seemed to indicate in a statement that there was a lack of communication in the Bulls organization under Thibodeau's leadership. "While the head of each department of the organization must be free to make final decisions regarding his department, there must be free and open interdepartmental discussion and consideration of everyone's ideas and opinions. These internal discussions must not be considered an invasion of turf, and must remain private. Teams that consistently perform at the highest levels are able to come together and be unified across the organization-staff, players, coaches, management and ownership. When everyone is on the same page, trust develops and teams can grow and succeed together. Unfortunately, there has been a departure from this culture," Reinsdorf said. Bulls Vice President of Basketball Operations John Paxson addressed the known strained relationship between Thibodeau and the Bulls front office during a news conference Thursday afternoon at the United Center. "Relationships are difficult when you have different personalities and things like that. But there has to be a situation where you can have open dialogue, where there are no barriers - you should be able to push the envelope to have some success. That's what relationships should be about. You have to have a situation where you're all pulling in the same direction, and once that stops, it's difficult to move forward," Paxson said. Although Forman said the decision came as a result of "a number of factors," both he and Paxson said the Bulls' playoffs loss to Cleveland - given the Cavaliers' injuries at the time - was disappointing. Following 21 years in the NBA as an assistant coach, Chicago named Thibodeau the team's head coach in 2010. During his five seasons with the Bulls, Thibodeau's teams compiled an overall record of 255-139 (.647). The Bulls advanced to the playoffs five times during Thibodeau's tenure, where he posted a postseason record of 23-28 (.451). Thibodeau's winning percentage ranks seventh in NBA history among coaches with at least 200 games. He led the Bulls to the top seed in the playoffs his first two seasons and was the NBA's Coach of the Year in 2011 - the same year Derrick Rose became the league's youngest MVP. When asked about what the organization may look for in its next head coach, Forman said the team is not "limiting" its search. "We're really looking for the right fit, somebody that can lead, but somebody that can communicate at a high level that has great knowledge of the game, we're not going to limit the search in any way," Forman said.